At Farmer's Pick we believe that some things were a whole lot better back in the old days. Supermarkets, for instance. 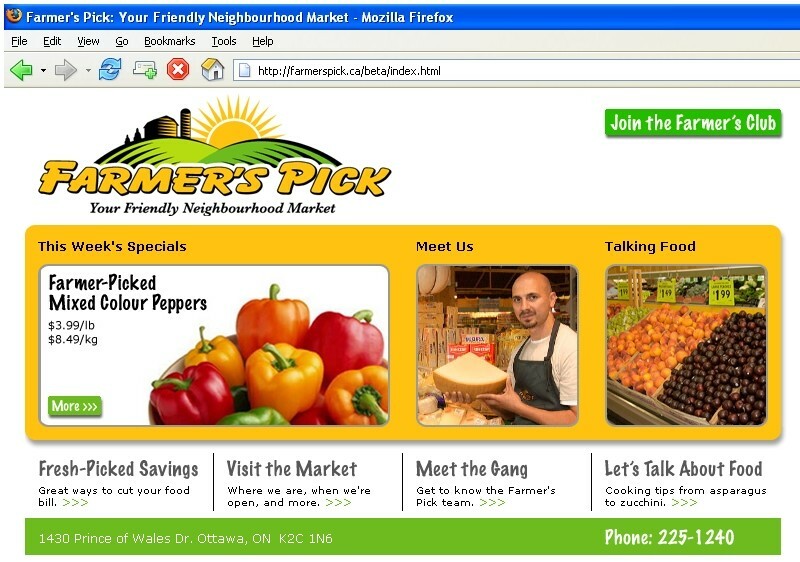 Remember when you could walk into your neighbourhood market and talk to the owner? Remember when the staff didn't change every few weeks? And when you could ask them a question and they could actually help you? Remember when a supermarket was big enough to carry everything you need, but not so large that you couldn't find your way around? Remember when a supermarket was a place that sold food, not hardware and cleaning products? And the food was carefully selected to taste great and stay fresh, not picked for looks and ease of shipping? Farmer's Pick brings you back to a time before supermarkets turned into mega-monster-superstores, a time before everything on the shelf had the same brand-name, and before food mysteriously started to lose its flavour. 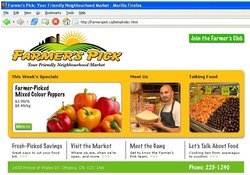 At Farmer's Pick, your friendly neighbourhood market is back. They're friendly, knowledgeable and passionate about great food. They're the people that make Farmer's Pick unique. Click the links below to meet some of the folks who've made us great. We opened our store in 1992 and ever since then people have been asking me "when are you going to open another one?" My answer's been the same for fourteen years: never. We've got something really special here, but it takes a lot of work and you can't do it if you're trying to run more than one store. I've seen too many people open up a great place and then they expand and before you know it quality starts to slide and service suffers. That's never going to happen here. Farmer's Pick is something special. It's a traditional supermarket where the owner is in the store. I'm here every day. I get in at six and I don't leave 'til suppertime. I've been doing that since we opened and, by now, I know almost every customer who walks through the door. They know me, too. Customers know that I'm out on the floor and very approachable. We don't have a suggestion box here and we don't do customer surveys. People just say "Hey! Alfonso, what about this or that." It's great. I'd say that most of the specialty items that we offer are here because somebody suggested it. If I had a bunch of stores, I'd never have time to talk to my customers. Staff are another reason I'm sticking with one store. We have a super team here. Most of the gang have been at Farmer's Pick for years. They're great people and we treat them well. But great people are really hard to find. Our department managers have been in the business for ages and they really know their stuff. And our cashiers are the friendliest in the city. I don't know where I'd find more people like that. We're so much different than those chain stores. This is a real, old-fashioned supermarket. There's nothing else like it in town. We're all about the food. We don't sell ceiling fans and barbecue tools and beach balls and other stuff that never should be in a grocery store. You won't find a pharmacy here, or garden centre, or a photo lab. What you'll find is a huge selection of high quality foodstuffs, everything from basics to hard-to-find imported products. You'll find food that's fresher and tastier than what you're used to. You'll find people that know their stuff and genuinely enjoy serving you. And you'll find all that at prices that are as low or lower than what you're paying now. I'm proud of Farmer's Pick. Come in soon and see why. I'm not just the store owner. I also personally manage the fruit and produce department. I can't remember a time when I wasn't working with fruit and veg. I got into the business at 14, with a part-time job in a produce store. I started out sweeping and packing and ended up doing every job in the store. I was still a teenager when I began managing the place. I learned about food from the last of the great produce guys. Harry Weltman was his name. What a character. He used to go nuts if he saw somebody mishandling food. But he knew everything about the business and most of what I know, I learned from him. Harry taught me how to look for the good stuff. Today, most buyers only care about price and appearance. But Harry showed me how to find produce that tastes great and will last a long time in the customer's fridge. That's what I do today. The farmers and suppliers know what I want. They know that I want the good stuff and that if they get it for me they'll earn my business. I'll get a call, "Hey, Alfonso! I've got really terrific cherries, let me send you some." And when they get here, they'll be great. Because these guys know that I see every piece of produce that comes in here, I unpack and display a lot of it, and I talk to my customers after they've taken it home and served it to their family. Plus I can pay them a little extra for the good stuff, too. We're so much leaner than the big chain stores. I don't have a warehouse and trucks to pay for. I don't have buyers on salary. So I can buy higher quality produce and sell it for less. People are always surprised the first time they come in and see our produce prices. Because, whenever you talk about quality, they think it's going to cost a lot. But the fact is, if you switch to Farmer's Pick from a big corporate chain store, you're actually going to see a savings on the cost of your fruit and veg. And you'll save more because my stuff lasts! New customers are often amazed because they've gotten used to produce that goes bad really fast. Then they come here and buy a lettuce that's still good after ten or twelve days and suddenly I've got another loyal customer. But the big thing is taste. Fruit that's juicy and full of flavour. Veggies that taste so good you don't need to drown them in sauce or dressing, just a little olive oil. There's just nothing better than that. We don't think of this as "the meat department." This is a butcher shop that just happens to be inside a supermarket. And when it comes to quality, service and value, that makes all the difference in the world. Go into a big supermarket these days and sometimes there isn't a butcher and everything comes pre-packed. Or maybe there's just one butcher doing the premium cuts. Here at Farmer's Pick there are six of us, all qualified butchers. And everything, and I mean everything (even chicken!) is butchered right here, by us. You can really taste the difference. We don't sit on our product. And our meat doesn't end up lying in a cooler for days before you take it home. That's not good for meat. Once you butcher meat, the flavour starts to drain. Our meat — the flavour is still in it. We get in chicken, pork and beef every day. And we butcher it as we need it. When you come in here and pick up a nice cut of meat, chances are it's been butchered that day or late the day before. And it's good meat, too. All our beef comes from Alberta farmers. It's matured 21 days before butchering. Our pork is local; we get it from farms just over on the Quebec side. Our lamb is Ontario lamb. Most veal is grain fed and sent to market at four to five months. Our veal is milk fed and sent to us at under three. All our hamburger is fresh ground. We even make the patties ourselves. And it doesn't cost you extra. It's a funny thing, but it actually costs us less to do all our own butchering and serve up fresh meat than it costs them to do it their way. All that cold storage and trucking stuff around costs money and you end up paying for it. So we can give you great meat at a great price. We've got a wider selection, too. And if you need help or have questions, you can talk to a butcher directly. We're the guys in the red coats. We're always around so if you're wondering what cut is best for what or how to prepare something, just ask. Or just bring in your recipe. And if you'd like something cut specially, it's all part of the service. That's the difference. This is a real butcher shop. This is a real family business. I'm Alfonso's brother. But that's not why I got the job. I've been in this business since I was eleven. So I guess you could say I know my cheese. It's a good thing, too. Because we've got so many different varieties here. I can't think of anywhere in town with a wider selection than us. Provolone alone, we carry four different types. We've got three sizes of Bocconcini. Parmesan — well, I'd have to count. We're a lot like one of those old-style, traditional European cheese shops, the sort of place you hardly see anymore. I think customer service is my favourite part of this job. It's very satisfying when someone comes in with a recipe and you can help them select something that works really well with the meal and suits the tastes of their guests. And it's great when they come back and they tell you how much everybody loved the meal and gushed about the cooking. I also enjoy it when people want help to discover different cheeses. Somebody might say, "I love sharp cheddar, but I want to try something new." And I can maybe suggest a Crotonese, for example. Which is fun because it's not only a great, sharp table cheese, but it's something you won't find at a chain store so it's a little bit exotic. I can always let people sample the cheese because we cut and pack all our cheese right here in the shop. The large stores cut and shrink-wrap their cheese in one location then ship it all over the place. Ours comes to us in 30 kilogram wheels and we cut it as we need it. So it's much fresher than the stuff most people are used to. And when you cut all your own cheese, you're keeping a close eye on quality. That's important, especially with our clientele. We have customers who've been eating Italian cheese every day for eighty years. If you give them anything second-rate, they're going to tell you about it! And because we do everything ourselves, we can usually beat the other guy's price. We're not transporting cheese all over the city so we don't have to pay for trucks and drivers and such. I don't think people should have to pay more just to get good food. I'd invite anyone who's been buying cheese at one of those chain stores to come in and see me personally. Ask for Johnny. There was a commercial on TV years ago that said their stuff was "fresher because more people eat it and more people eat it because it's fresher." That's us, for sure. We're right in the heart of a large Italian and Central European community. These are people who love deli meat and eat lots of it. So our turnover is incredible. In a week we'll easily go through a dozen Mortadellas, ten kilos of turkey breast, and loads of everything else. So you just won't find fresher deli meat anywhere in Ottawa. And you won't find a better selection either. We have as wide or wider selection than even a specialty shop. And the big grocery store chains can't even come close. Who else in town has six varieties of Capicollo, three flavours of Porchetta and six different types of Prosciutto? Nobody, that's who (isn't that another TV commercial?). We also offer all-natural, smoked bacon. Try it once and you'll never go back to that horrible packaged stuff, especially since ours costs about the same. We've got thick juicy sausages made specially for us to my own family recipe. Choose hot or mild. And I make home-made soup in the winter (more secret family recipes). Drop in sometime and I'll show you what we've got here. I'm the big guy who looks like he's been in the business forever, which I have. I started out way back at a place called Arnone Foods on Preston. The deli meat vendors would come by every morning, I'd select what I wanted and we kept it right out on the counter. I tell you, the aroma was irresistible. It sure helped sell a lot of meat! These days we don't leave the meat out, but flavour, freshness and aroma are still what sells. So I like to hack off chunks and let people sample what we have. Another great way to try-before-you-buy is to have us make you a fresh bun or sandwich. Sandwiches are really popular, especially with the lunch crowd from nearby offices. We make an endless variety, but customers in the know ask for "the Mario special." I'd tell ya what's in it, but not here. You're going to have to come in and find out. There are only a couple of from-scratch bakeries in Ottawa and we're one of them. And we're the only one in a supermarket. We do everything from scratch, in the traditional manner, the way it's been done for hundreds of years. It's a dying art, but we're keeping it alive. These days, if you go into a big grocery store, you won't find any scratch ingredients there. No flour. No yeast. No mixers. Nobody who can actually bake. Everything they do is done from frozen. They'll either use frozen, partially cooked bread which they just toss in an oven for eight minutes. Or they'll use frozen dough. It's awful stuff. There's no flavour. It goes stale fast. And it's often full of chemicals to keep it consistent during shipping. We use four ingredients: flour, water, yeast and salt. We use no oils, lards, shortening (except pie dough), chemicals or fats. It's good, healthy food. And you'll taste the difference. If you've always thought of bread as just something to keep a sandwich together, let me introduce you to bread with real flavour. There are three bakers here, including me, and we start at eleven at night and keep going until morning. It takes five hours to make a loaf of bread. It's hard work, too. People don't realise it, but you break your back baking bread. But it gets in your blood. And it's so rewarding when the hot loaves come out of the oven. Speaking of which, that massive shiny thing with the big chimney is my oven, a Cinelli-Esperia from Italy. It's a real baker's oven, not like those tiny little warming boxes the chain store "bakers" use. Mine is a 56-pan oven with a brick heat chamber and real stone shelving. It's skilled work to operate it (you don't just turn a knob and set a timer) but if you know what you're doing you get absolutely even heat, great flavour and perfect crusts. We bake pretty much every type of Italian bread here. And as well as white bread, we offer flax seed, nine grain, rye, corn and whole wheat bread. Our prices are very reasonable. A regular loaf is $2.25. Baguettes are $1.50. The most expensive thing we sell is a huge, family sized loaf. It's a full kilogram of delicious bread for three bucks. There's no need for anyone to eat bad bread. In France and Italy, where they take bread very seriously, baking is always done from scratch. If you went into a bakery in a small Italian village, you'd see a guy like me, with an oven like mine, baking bread like this. Sometimes you really can have it all. At Farmer's Pick you'll find great food, great service and great prices. Here are three ways to eat better and spend less. Better food doesn't have to cost more. At Farmer's Pick, it can actually cost less. We're not part of a large chain, a big corporation or a franchise. We're a small, independent, family-owned neighbourhood market — hard-working folks in a well-run store. We keep things simple because food tastes better that way. And, despite all the big guys' talk about buying power and corporate efficiency, the simple ways tend to be less expensive, too. Our goal is simple — to offer a great selection of fresh, healthy, tasty food at prices that are as low or lower than what you're paying now. Why not try us for yourself? Give up your big, impersonal, boring chain store (don't worry, they won't miss you) and try Farmer's Pick for seven days. Enjoy the friendly service and great food for a week. But keep your receipts and compare at the end. We're sure you'll see the difference on your food bill. You'll certainly taste it at the dinner table. This is where the weekly flyer goes. Only Farmer's Club members enjoy secret, "insider" specials. These are extra savings on a wide range of products — savings that are never advertised or posted in the store. Farmer's Club savings come directly to you by e-mail. Simply print the coupon that comes with the message and present it with your purchase. You can also let friends and family in on the "secret" by forwarding the coupon to any e-mail address. There's no cost to join or obligation to purchase. And, naturally, we respect your privacy. Your e-mail address will not be released to a third party or used for other purposes. And you can opt-out any time. Simply reply to any Farmer's Club message, add the word "unsubscribe" to the subject line and press "send." We'll promptly and permanently remove your name and address from our membership list. Join now by filling in the form below. And start saving right away. If you'll be eating your bread within a day or two, store it in a paper bag to preserve taste and texture. If you'll be keeping it longer, store it in a plastic bag. Plastic keeps flavour longer, but you do lose a little crust texture. Always store bread in a cool place, but not in the refrigerator. You can freeze bread. When you're ready to eat, simply place the frozen loaf in a medium oven and re-heat for 7-8 minutes. Cheese is probably the easiest way to fancy up a simple dish, or put an exciting new twist on an old favourite. Try crumbling chunks of Greek or Canadian Feta into your next salad for an unexpected dash of flavour. In BBQ season, toss out those plastic wrapped processed cheese slices. Add a gourmet touch by topping your hamburgers with a thick wedge of blue cheese and allow to partially melt. Here's a delicious way to enjoy fresh asparagus. First, to separate the good part from the bad, hold each spear by the ends and bend until it breaks. Throw away the stalks. Wrap a piece of fresh prosciutto around each spear and steam or bake. When asparagus is not in season, enjoy prosciutto wrapped around bread sticks, cantaloupe or figs. Fruit is healthy food and everyone, especially children, should eat some fruit every day. But getting the kids to eat fruit isn't always easy. Sometimes, though, it's not the kids, it's the fruit. Much of the fruit sold today looks great, but has little or no real flavour. Our fruit is fresh, juicy and bursting with great taste. My kids love it. I'm sure yours will, too. The choicest cuts of meat come from parts of the steer that don't move much, such as t-bone steak from the steer's back. But lesser cuts can be tenderised with an easy marinade. Simply place meat in a Ziploc bag, add a cup of cheap red wine, toss in your favourite seasonings, squeeze out the air and place flat in the fridge for 12 to 24 hours, turning occasionally. Those bags of pre-cut, pre-mixed salad sure are convenient, aren't they? But we don't sell them because they're prepared in California then gassed up with chemicals to make them look fresh days later. We don't like eating chemicals and we're pretty sure you don't either. But if you can use a knife, you can still enjoy great salad. Let us help you select a nice mix of fresh ingredients to make your own. It's better for you and tastier, too.